This posts describes how students can explore complex texts through a hypertext literary analysis. By using PowerPoint—a common program that is readily accessible on most computers—students are able examine the multiple layers of meaning in a passage through hyperlinking words and phrases to written explanations and related media. Multiple modes are employed—including text, music, images, animation, and videos—to help students dig deep into the textual features, intertextual connections, and personal responses that produce meaning in fiction and poetry. This strategy uses PowerPoint to create a multimodal hypertext with interconnected slides. The composing process begins by inserting the text to be analyzed on a blank PowerPoint slide, which functions as the anchor of the hypertext. Next, students can create a deck of blank slides that can easily be linked from the analyzed text. Words or sections of the text can now be hyperlinked to other slides by using the ‘Insert’ menu and designating the desired destination for the link. The majority of links will lead to other slides within the document, but hyperlinks can also be used to connect to other documents or to websites (video tutorial on hyperlinking in PowerPoint). Once a clear and fluid structure has been established in PowerPoint, it’s time to begin incorporating multiple modes for analysis. Analysis slides will, of course, include written explanations of the textual features being explicated, but this strategy also asks students to use media to deepen and support the analysis. PowerPoint allows users to embed images, audio, and video and offers tools for editing and layering these media. Students can manipulate their chosen media to reflect themes in the text or to illustrate their personal response (see Smith & Renner, in press for more information about integrating a hypertext literary analysis in your classroom). 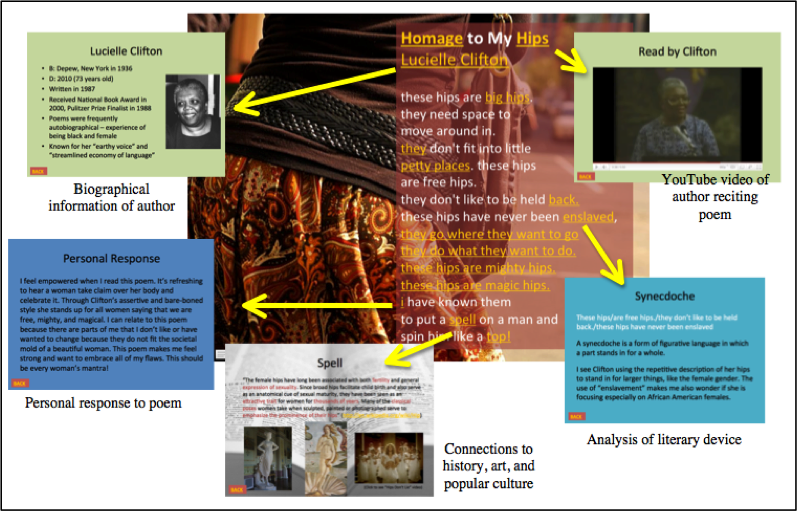 For example, in a hypertext literary analysis of Lucille Clifton’s poem “Homage to my Hips,” the composer hyperlinks from a PowerPoint slide that contains the original poem to other slides that include Clifton’s biographical information, intertextual and pop culture connections, a YouTube video of Clifton reciting the poem, analysis of literary devices, and personal response. Images, color, videos, and music are also used purposefully to organize, supplement, and extend the written analysis. There are a variety of ways a hypertext literary analysis can be adapted. Melanie Hundley at Vanderbilt University asks pre-service English teachers to explicate poems through hyperlinks and multiple modes (Hundley & Holbrook, 2013). Nicole Renner and I used this assignment in a 12th grade AP Literature and Composition class for students to analyze important passages from Tim O’Brien’s The Things They Carried. Through hyperlinks, students examined literary elements, such as metaphors, irony, and theme. They also hyperlinked to intertextual connections, including other literary works, films, and popular culture references, as well as key words and phrases, questions, and personal reactions (Smith, 2013; Smith & Renner, in press). This type of nonlinear and multimodal analysis supports students to develop important literacy skills, including reading and comprehending a complex literary text, interpreting words and phrases with connotative and figurative meanings, and examining themes, structures, and points of view. Hundley, M. & Holbrook, T. (2013). Set in stone or set in motion? : Multimodal and digital writing with preservice English teachers. Journal of Adolescent and Adult Literacy, 56(6), 500-509. Smith, B. E. (2013). Composing across modes: Urban adolescents’ processes responding to and analyzing literature. Unpublished doctoral dissertation, Vanderbilt University, Nashville, TN. Smith, B. E. & Renner, N. B. (in press). Linking through literature: Exploring complex texts through hypertext literary analysis. In T. Rasinski, K. E. Pytash, & R. E. Ferdig (Eds.). Using technology to enhance reading: Innovative approaches to literacy instruction. Bloomington, IN: Solution Tree.